It was almost a full programme of league fixtures on what had to be difficult conditions after the recent rain. League leaders Horncastle Town Reserves had, what on paper, was a difficult game, as they visited unbeaten Fulbeck United, a side which had conceded only two league goals in their last six games. Victory for either side would see them go top of the table. Horncastle were looking to register a fifth successive win, something they would have to search in the records for a long time to find its equal. In a really entertaining game, Fulbeck were to see their ‘goals against’ column more than double as they conceded three league goals for the first occasion in a 3-3 draw. Chris Bates (2) (his fifth of the season) and Tom Vertigan scored their goals, while Rob Morey was again on target for Horncastle with two more goals, his 10th in the last five games and 11th in total. Ash Bond scored their other goal, with his second in two games. With Horncastle and Fulbeck sharing the points and Birchwood United inactive, fourth placed Cherry Willingham were also poised to move up the table as they visited AFC Crown and Arrows, who had not won a league game since back to back victories at the start of the season. Cherry, like Horncastle, were seeking a fifth successive win, something they too had not achieved in many a long year. The home side made them work for this win and the only goal of the game, scored by Brendan Foster-Matthieson, saw Cherry secure the three points. This win was enough to take them top of the table on goal difference from Horncastle with a game in hand, while Fulbeck are third, above Birchwood on goal difference. Further down the table sixth placed Retford Town visited bottom side Saxilby Athletic, looking to register their first double of the season, something they had not done, since beating Monos twice in the 2013-14 season. Going into this game, Saxilby had scored just five goals in their previous six games and were still after a first win of the season and first victory of any kind since February 2015. In another entertaining game in difficult conditions, the two sides shared seven goals with Saxilby bagging four in a 4-3 win. Netting their goals were Michael Ward (2), Mike Kelman and Huw Jones, with Dan Law (2) and Kev Metcalfe scoring for Retford. 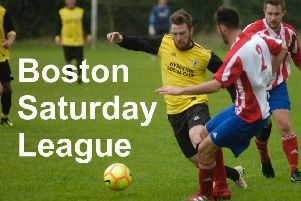 The final game saw second to bottom side Railway Inn host seventh placed Ruston Sports. Going into the game, Railway had picked up just one point in a draw against Crown and Arrows in October, while Rustons’ last away win was against the same opposition in the same month. Railway were left still seeking their first win as Rustons ran out 3-1 victors. Kev Smith scored for the home side, however the Rustons scorers are not to hand. These last two games saw both Rustons and Retford climb above Crown and Arrows, with Rustons going fifth and Retford remaining sixth, with a better goal difference than Crown and Arrows. Saxilby also moved off the bottom for the first occasion relegating Railway Inn into this position.